Strains of a highly-resistant superbug have been found on two hospital wards. 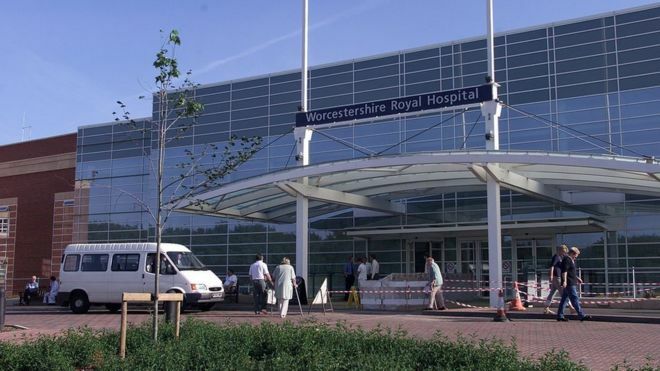 Klebsiella Pneumoniae Carbapenemase (KPC) was found at Worcestershire Royal in June. Action was taken to clean the wards but the hospital has maintained a red rating, issued by NHS Improvement (NHSI) which means there’s a risk or elevated risk of infection. It is known 24 patients were affected, including one with blood poisoning. The hospital’s chief nursing officer, Vicky Morris, said the trust was tackling poor cleaning practices. KPC, which can cause urinary tract infections and pneumonia in sick patients, was first identified on the orthopaedics and trauma ward and another ward known as Laurel 3. The bug is resistant to carbapenem antibiotics which work against multidrug-resistant bacteria. Although “good progress” has been made on Laurel 3, a report from a visit by NHS Improvement in October showed serious failures in infection control in orthopaedics and trauma. The report, seen by the BBC, said the ward’s bed pan washer was not working, disposable urinals were being reused for 24 hours and blood was spattered on a clean tray in the clinical room. The trust has changed the ward manager and matron on trauma and orthopaedic and leadership of the hospital’s infection control team. Ms Morris said the superbugs are becoming more common in the general population and that the hospital has increased its focus in this area. Public Health England said it is working with the trust to improve its infection control standards.